New work by LMU researchers demonstrates that macrophages can effectively substitute for so-called dendritic cells as primers of T-cell-dependent immune responses. Indeed, they stimulate a broader-based response. 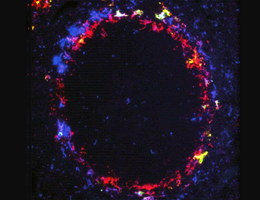 The targeted antigen (yellow) is selectively taken up by macrophages (blue, red). The immune response, the process by which the adaptive immune system reacts to, and eliminates foreign substances and cells, depends on a complex interplay between several different cell types. So-called dendritic cells, which recognize and internalize invasive pathogens, play a crucial role in this process. Inside the dendritic cells, the invader’s proteins, including those (“antigens”) that distinguish it from host cells, are degraded into short fragments, and displayed on the cell surface in association with a specific binding protein. The foreign antigens exposed on dendritic cells in turn alerts another class of immune cells called T-cells to actively attack the invader, effectively inducing an immune response to that specific pathogen. A team led by Professor Thomas Brocker, Director of the Institute of Immunology at LMU, has now shown that macrophages that function as a first line of defense in the innate immune system can also present antigens to T-cells, thus revealing a previously unknown role for macrophages in the induction of adaptive immune responses. The results of the study are reported in the “Proceedings of the National Academy of Sciences” (PNAS). “It has been assumed until now that the dendritic cells are considered to be essentially the only cell type responsible for antigen presentation in the immune system. We have now discovered that macrophages can also do this job. Not only that, in certain situations, they can be more effective than dendritic cells,” says Thomas Brocker. Dendritic cells present antigens to so-called cytotoxic T-lymphocytes (CTLs) if they have been directly infected, but they can also capture and display antigens from other cells. This type of indirect antigen presentation is referred to as cross-presentation. “So, theoretically, dendritic cells could be responsible for the induction of all CTL-based responses, regardless of whether they are themselves infected or not. But the significance of cross-presentation is hotly debated in the literature,” says Brocker. In the study, Brocker and his team used several antigens that were specifically targeted to and processed by macrophages, but could not be taken up directly by dendritic cells. They were able to demonstrate that each antigen nevertheless induces a normal immune response in a mouse model system, and even in a mouse strain that lacked dendritic cells altogether. Further experiments showed that the targeted macrophages were actually able to prime a more comprehensive immune reaction than cross-presenting dendritic cells. They activated T-cells specific for all antigen-binding sites (so-called epitopes) presented, whereas cross-presentation by dendritic cells stimulates only those T-cells that recognize immunodominant, i.e., the most effective, epitopes. Macrophages are normally the first immune cells in the body that come into contact with invading pathogens. “Macrophages naturally function as filters; they gobble everything up that might be harmful to the organism. And our study shows that, in contrast to cross-priming dendritic cells, they are capable of producing and presenting all T-cell-priming epitopes we tested. Macrophages therefore induce a complete immune response. These observations indicate that the significance of cross-presentation by dendritic cells has been overrated,” says Brocker. The new findings are relevant for the development of immunization strategies. “Preclinical trials are already underway with vaccines that are designed to activate specific sets of dendritic cells. But the weak epitopes are important for a broadly directed immune response, because they can potentially recognize mutant variants of viruses, for instance. Cross-priming dendritic cells fail to induce weakly antigenic epitopes, as our study shows. Our results indicate that it may make more sense to manipulate macrophages directly, because they stimulate a wider-ranging immune response,” says Brocker.